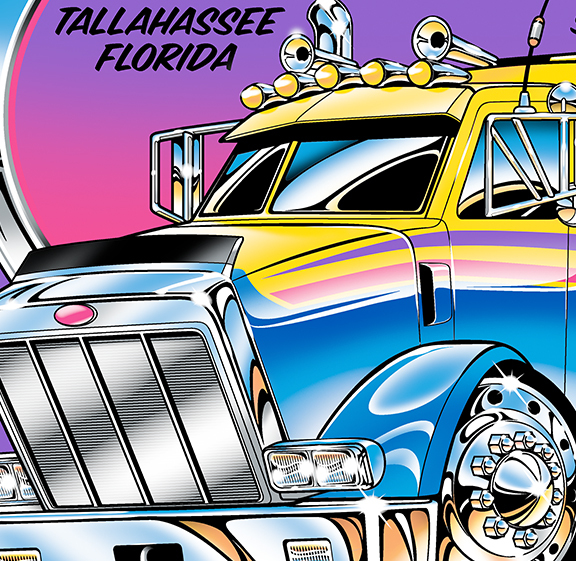 Recently I was contacted by Parkway Wrecker in Tallahassee, Florida, to see if they could purchase my Big Tow artwork for use on their business cards. My Big Tow art is one of my most popular designs – and also the most ‘ripped off’. Luckily I’ve been able to call out most of those right-click-save-as-I-found-it-on-the-internet types, thanks to the wonders of social media and belonging to a large network of Car Artists who look out for each other. SO when Parkway contacted me, I replied saying not only is it for sale, but since they asked to purchase it, I’d be more than happy to change the look of Big Tow to match their trucks’ bright livery, and lay out a business card for them. Here’s the livery of the fleet – pretty cool, huh? That turned into a conversation about getting artwork for a t-shirt, and I offered to create one for them that was color separated and ready to go. The back is using spot color channels in Photoshop, and the front left chest art is vector artwork. Very cool turnout of events. Awesome work and love the layouts. Inspiring as always. Keep on Rocking, er should I say Drawing!